For Anthony, Hope is home. 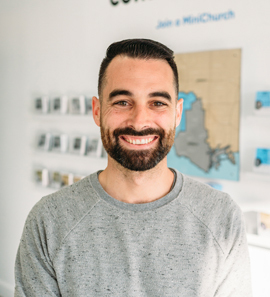 He grew up within the Youth Ministry at Hope Chapel and attended the Church’s Homeschool Academy. Anthony met his wife Krista while attending the School of Architecture at USC. They share a passion for multi-generational discipleship, small-group ministry and creative projects. Together, they lead a local architecture and design studio. They have three young boys, who all enjoy playing in the local South Bay surf.